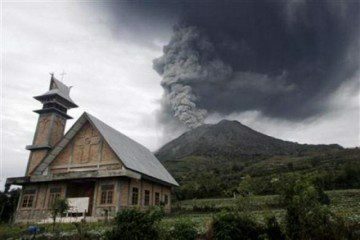 The recent eruption of Mount Sinabung in Indonesia is increasing demands on The Salvation Army’s Compassion in Action team that is working in the region. It began erupting in September 2013, and the Army has since worked to meet the needs of people displaced by the disaster. Since late January the volcanic activity has become even more violent, so far claiming at least 16 lives. More than 30,000 people are homeless and living in temporary community camps run by the government in association with The Salvation Army. So far the Army has provided more than 10,000 people with temporary housing, food, medical aid and spiritual guidance. With the volcano still very active, The Salvation Army officer overseeing the emergency operation, Major I. Ketut Putrayasa, said the current phase of the response—caring for people living in temporary accommodation and supplying their immediate needs—is likely to continue for some time. In the longer term The Salvation Army will also look to play a part in the relocation of people who have lost their homes and in any rebuilding programs.